We can’t ignore that children have emotions. As behaviourists, we are trained to treat behaviours and not private events like thoughts and feelings. But how can we ignore that some of the little people we work with are struggling with managing how they’re feeling? 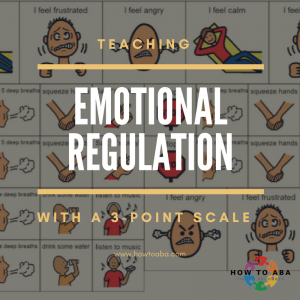 We need to allow for our students to have these emotions – we all do – but it’s also important to teach them coping strategies and emotional regulation techniques. In terms of social significance, this is a big one! Yes, as Behaviour Analysts, we only implement strategies and programs that are evidence-based. Yes, we need to be able to describe behaviour in ways that are observable and measureable. Yes, we need to continuously take data and analyze the data to make any necessary changes. 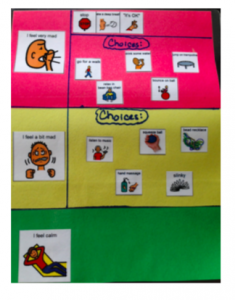 So how can teach emotional-regulation strategies in a behaviour-analytic way? Don’t assume that a child knows what “anxious” or “frustrated” mean. When teaching about an abstract concept such as feelings, it’s important to use visuals. There are different ways to do this depending on the age and skill of the learner. You can use a visual of a stoplight with red, yellow, and green corresponding to different emotional states. If the student can read, the strategies can be written right beside the colours. 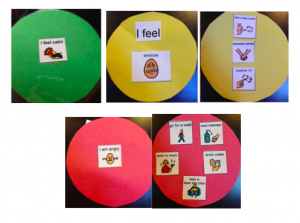 For younger students, we’ve used a simple flip-book with small circles corresponding to the different emotional states. On the front of the circles is a picture of the emotion and on the back are pictures of different calming strategies. With prompting and fading, the student can learn to flip to the colour that she is feeling and then engage in the calming activities. Do LOTS of modelling, both of you labelling your own behaviour and of you labelling the student’s behaviour. When something happens to frustrate you, say something like, “I’m feeling so frustrated, I need to take a drink to calm down.” Also make sure to label the student’s behaviour – “I like how calmly you’re sitting. You look like you’re feeling green.” Or “You’re shoulders are raised, it seems like you’re heading towards yellow and feeling upset.” At this point, there’s no demand on the student other than to tolerate the therapist/teacher making the comments. With proper shaping and prompt fading, the student should eventually be able to identify and label her own behaviour, receptively and then expressively. I don’t know about you, but when I’m very upset, it only makes me feel worse when someone tells me to “calm down” or “relax”. During the heat of the moment, we’re not thinking straight. It’s not the time to try and turn the incident into a teaching moment. When should you teach? Find a moment when the student is calm and make this into a positive experience. When the student is calm, role-play the behaviours that will help regulate his emotions. Practice engaging in behaviours such as “taking deep breaths”, “counting to 5”, “going for a walk”, etc. 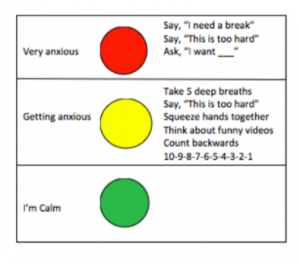 These may need to be tweaked as you figure out what actually calms the student. Give the student feedback on how she’s doing. Reinforce behaviours such as “staying calm” or “letting others know how you feel”. If there is an explosive episode where the regulation strategies weren’t used, debrief on that one too. When the student is calm, review the incident and talk about how they can make it better next time. Set up practice situations in novel environments and with novel people so that the student can practice using the strategies and accessing reinforcement for the behaviours they’re displaying. We want to use these strategies to teach our students that it’s okay to have these feelings. We want to help them understand them, express them, and then manage them. With successful teaching and practice, students can become masters of their own behaviour!